The Maple Leafs entered the Olympic break with an impressive 7-2-1 record. But with 22 games to go, a playoff position is anything but guaranteed. With that in mind, here are 5 questions that Leafs Nation should be asking ahead of a meeting with the New York Islanders on Thursday. 1. Can the top line keep on firing? In what is undoubtedly a flawed group of players, one factor has remained consistent – the stellar form of James van Riemsdyk, Phil Kessel and Tyler Bozak. Whilst the first two had a solid Olympics until the 5-0 drubbing by Finland, Bozak has been sitting idle and it will be interesting to see whether the trio can pick up straight from where they left off. Kessel returns on the back of being named the best forward in the Olympics and was in deadly form prior to the break – with 31 goals the 26-year-old is 2nd in NHL scoring behind only the rejuvenated Alex Ovechkin. With an unbalanced offence, Randy Carlyle will need the readjustment period for his most productive forward line to be minimal. 2. Will Joffrey Lupul rediscover his form? Lupul has endured a difficult campaign by his standards, with only 3 goals in his last 15 and a -10 rating. Playing with Nazem Kadri and Nikolai Kulemin, two players who encapsulate the Leafs’ erratic form, may be a contributing factor but Lupul will need to find his touch to redress the balance of scoring. It is a shame for both player and club that Lupul’s form has been unreliable – his is a face of leadership and character arguably lacking in Toronto and especially on the forward lines. The form of the top line means it is unlikely he will find himself promoted unless that line suffers a slow start. 3. Will Dave Nonis make a splash in the trade market? The trade deadline is next Wednesday and drastic change to the Leafs’ roster, for the moment at least, is looking unlikely. Dave Bolland, out of the lineup since early November but due for an imminent return, will be an unrestricted free agent at the end of the season along with Kulemin, whose defensive strengths haven’t prevented his name continually being banded about as as player the Leafs might look to offload. 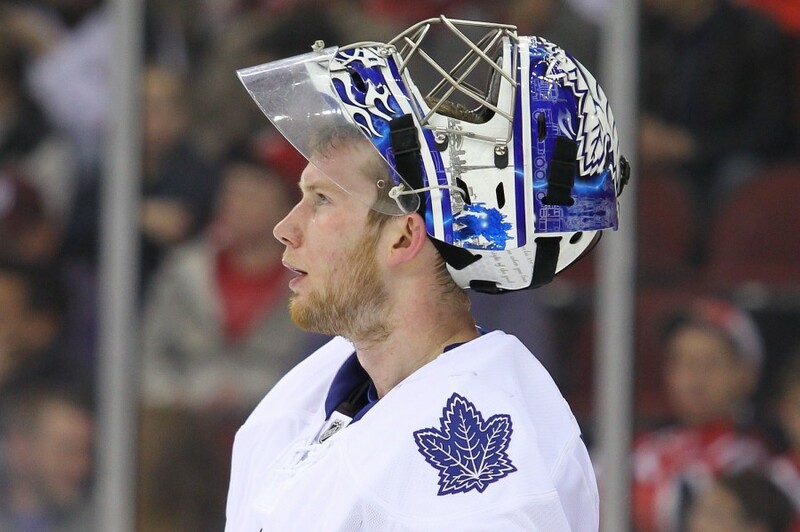 Getting rid of James Reimer would seem to make very little sense – leaving the talented if occasionally leaky Jonathan Bernier without a decent backup would be risk not worth taking. 4. How will the Leafs cope with the upcoming schedule? Road form has been tricky for the Leafs so far. They’re 11-17 on the road, and 13 of their remaining 22 games are outside the comforts of the Air Canada Centre. Moreover, in the next 10 games the Leafs will have to face the West Coast powerhouses of Anaheim, San Jose and Los Angeles. For what has been an unreliable season for this group, a bad road trip could dent confidence and make the run to the playoffs a very nervous time indeed. On the flip side of course, claiming the scalps of those teams could give the Leafs a welcome boost ahead of a final run to the playoffs. 5. Are the Leafs for real this time? The eternal question. The truth is, noone really knows what this Leaf team is capable of. They were many who were convinced (and still are, including pessimistic Leafs faithful) that the club overachieved last season, and that the dramatic loss to the Bruins was merely a smokescreen to the fact that they didn’t particularly deserve to be in the playoffs in the first place. This inconsistency this season has done nothing to convince the doubters otherwise. Solid runs of victories have been followed by abject defeats to poor teams, with little or no explanation other than they were having an off night. The major worry remains that beyond the top line, the Leafs are a majorly flawed hockey team, with weaknesses in secondary scoring and at the blue line. Captain Dion Phaneuf, who has been largely solid and impressive this season, will need to muster all his qualities of leadership and inspiration to ensure his team get to the playoffs. Then, and only then, can they start thinking about laying the ghosts of the TD Garden to rest.